Oak Vancouver Glazed 4 Light FD30 Fire Door. Perfect Commercial Door. Oak Vancouver Glazed 4 Light FD30 Fire Door. Four large horizontal vision panels. Particularly suited for Commercial Applications, offices, corridors, meeting rooms. Vision panels surrounded by raised mouldings on both sides. 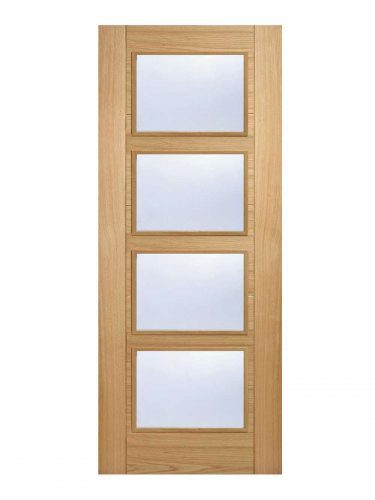 The perfect additional partner to the Vancouver 5 panel door range. Oak Vancouver Glazed 4 Light FD30 Fire Door. The perfect door for commercial applications! Add Light and Add Safety to corridors, offices and meeting rooms.